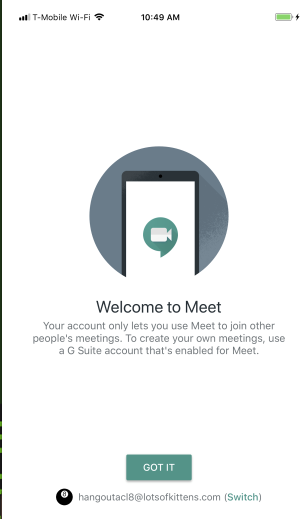 “Your account only lets you use Meet to join other people's meetings. To create your own meetings, use a G Suite account that's enabled for Meet." This message is already shown to users on the web. It will primarily reach non-G Suite users’ accounts, but admins may receive requests from their users who do not have Meet enabled for their domain and/or organizational unit.